Visit the all new website Invited by Lama Works to find out more about my store! 1. Add sweet potatoespotatoes to a saucepan; cover with water; add in some salt and bring to a simmer. 2. Cook for 12 minutes or until fork tender; drain potatoes in a colander, then return the potatoes to the pan and let them dry out on the stovetop. 6. Sprinkle the vegetables with flour and continue to cook for 1 minute. 7. Whisk in the wine and simmer 2 minutes. 8. Add in the chicken stock; continue to simmer 4-5 minutes, or until thickened. 9. Add the cooked sweet potatoes and the shredded chicken; continue to cook 2-3 minutes or until the chicken is warmedthrough. 10. Add in the parsley; taste for seasoning and adjust. 14. Serve with crusty bread. Arrange the plum tomato halves skin side down, with the onions on a rimmed cookie sheet. Drizzle EVOO on the vegetables and season with salt and pepper. Broil for about 4 minutes, flip and continue to broil for 3 minutes, or until the tomatoes and onions are slightly charred. Lower the oven setting to 400 degrees. Stretch out the dough, gently spreading its rectangle shape. Cut the dough into 4 equal pieces: working across the dough cut it in half and cut each half in half again. Cover each piece of dough with 2 tbs of pesto, then prosciutto and 1 slice of provolone. Roll each piece on an angle from corner to corner, making a long roll that is thicker in the middle and thinner on each end. Brush the rolls with EVOO, then sprinkle the dried italian seasoning on top. Place in the oven, and bake until evenly golden, 12 to 14 minutes. Place the tomatoes and onions in a blender or food processor, and puree until somewhat smooth. Preheat a soup pot over medium high heat, add the 2 tbs of EVOO, add the garlic and the remaining 1/2 tsp of red pepper flakes. Saute the garlic for a minute, then add the pureed veggies and the chicken stock. When the soup comes to a bubble, add the cream, then season with salt and pepper. Simmer the soup for 8 to 10 minutes. When ready to serve, turn off the soup and stir in the basil. Adjust the salt and pepper. Serve the soup alongside the pesto and stromboli, dipping them into the soup as you eat them. Melt unsweetened chocolate and butter in a microwave; stir until smooth. Cool slightly. In a large bowl, beat the cookie mix, egg, milk, vanilla and chocolate mixture. *Note: My batter at this point was pretty thin, I had to add in an extra 1/2 cup flour to thicken it up to the right cookie consistency* Drop by tablespoonfuls 2 in. apart on ungreased baking sheets. Bake at 350° for 8-10 minutes or until edges are set. Press a candy into the center of each cookie. Let stand for 2 minutes. Sprinkle with salt. Remove from pans to wire racks to cool completely. Yield: 4 dozen. To Make Ahead: Cookies can be stored for 1 week in an airtight container at room temperature. Combine enchilada sauce and salsa verde in a small bowl. In a large skillet, cook beef over medium heat until no longer pink; drain. Stir in 1/2 cup sauce mixture. Spoon 2/3 cup beef mixture off center on each tortilla; sprinkle each with 3 tablespoons cheese. Fold sides and ends over filling and roll up. Transfer to a greased 11-in. x 7-in. baking dish. 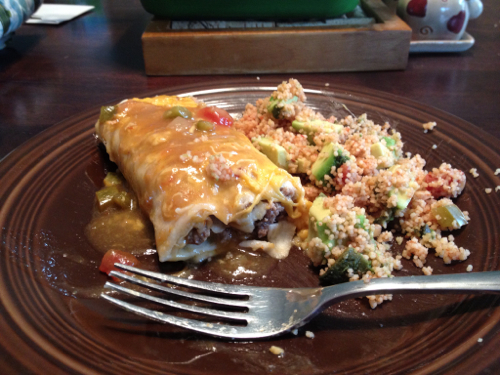 Pour remaining sauce mixture over burritos; sprinkle with remaining cheese. Bake, uncovered, at 375° for 10-15 minutes or until cheese is melted. Yield: 4 servings. Bring salsa and water to a boil in a small saucepan; stir in couscous. Cover and remove from the heat. Let stand for 10 minutes. Fluff couscous with a fork; stir in beans. Top servings with avocado. Yield: 4 servings. Combine 1/2 teaspoon garlic powder, salt and pepper; sprinkle over pork chops. In a large skillet, brown pork chops in oil. Remove and keep warm. Remove skillet from heat and add wine, stirring to loosen browned bits from pan. Bring to a boil; cook until liquid is reduced by half. Reduce heat to medium. Whisk in the broth, mustard, and remaining garlic powder; cook and stir for 1 minute. Whisk in cream; cook and stir for 4-6 minutes or until thickened. Return pork chops and juices to the skillet. Cover and cook for 3-5 minutes or until a thermometer reads 145°. Let stand for 5 minutes before serving. Yield: 4 servings. Preheat the oven to 400. Cut the squash in half, scoop out the seed. Place the squash on a baking sheet cut side up and roast for 45-60 minutes. Time will depend on how large your squash is. It's done when it is very tender. Let it cool a bit and scoop out all of the squash and placde into a bowl with the mayonnaise, onion, egg, salt and pepper. Transfer to a greased 1-qt. baking dish. Combine the cracker crumbs, cheese and butter; sprinkle over top. Bake, uncovered, at 350° for 30-40 minutes or until heated through and top is golden brown. Yield: 6 servings. Combine all ingredients into the slow cooker. Cover and cook on high for 4-5 hours. Stir every hour or two and mush things around and break up the meat. If you prefer a chunkier chili, sautee the turkey and, onions and peppers up before you put it in the slow cooker, then cook on low 4-5 hours. Yield: 10 servings (2-1/2 quarts). Melt 2 tablespoons butter in a large saucepan. Stir in the flour, rosemary, pepper and salt until blended; gradually add milk. Bring to a boil; cook and stir for 2 minutes or until thickened. Remove from the heat; stir in cheese until melted. Spoon 2 cups stew into a greased 2-1/2 qt. baking dish. Layer with half of the potatoes and sauce mixture. Layer with remaining stew, potatoes and sauce. Cover and bake at 400° for 45-50 minutes or until potatoes are tender. In a microwave, melt the remaining butter. Stir in the crackers, parsley and garlic powder. Sprinkle over casserole. Bake, uncovered, 5-10 minutes longer or until bubbly and topping is golden brown. Let stand for 10 minutes before serving. Yield: 6 servings. Combine the flour, 1 teaspoon salt and 1/2 teaspoon pepper in a large resealable plastic bag. Add beef, a few pieces at a time, and shake to coat. Brown beef in oil in batches in a large skillet. Transfer meat and drippings to a 6-qt slow cooker. Add the potatoes, carrots, onion and celery. Combine the broth, juice, garlic, Worcestershire sauce, bay leaf, thyme, basil, paprika and remaining salt and pepper; pour over top. Cover and cook on low for 8-10 hours or until meat and vegetables are tender. Combine cornstarch and water until smooth; stir into stew. Cover and cook 30 minutes longer or until thickened. Discard bay leaves. Yield: 10 servings. Here is what’s for dinner this week! Monday – Chilly Night Beef Stew – My husband’s new favorite stew recipe! Fair warning that this makes TON of stew. I pared down a few of the ingredients and still had enough for dinner on Monday, leftovers for Tuesday’s diner, plus lunch for a few days. Tuesday – Layered Potato Beef Casserole – made with leftovers from Monday. A bit too many potatoes or my liking, but good enough to eat. Wednesday – Black Bean and Pumpkin Turkey Chili – My 2 year old had 3 bowls! Thursday – Pork Chops in a Honey Mustard Sauce with Butternut Squash Bake – The only way I want to eat butternut squash! Bonus recipe – Salted Caramel Fudge Drops – Warning – these are amazing, you’ll want to eat all of them and they are definitely NOT healthy in any way shape or form! Officially, this is what we had for dinner last week. When I cook I tend to use recipes more as a suggestion than the law. My goal here is to pass on to you how I actually made dinner by swapping out ingredients I don’t care for or to use up something else I already had on hand. Most recipes should have a link to the original or at least the name of the cookbook that they came from if you’d like to look at where my inspiration came from. Don’t forget to stop in every day for the recipe, or better yet – add me to your RSS feed so dinner just pops right into your in box! At the end of the week you can find direct links to each recipe in the "Weekly Meal Plan" tab up top. This recipe quickly became a family favorite recipe. FYI - it is FABULOUS used leftover on a panini! We tend to turn many of our leftovers either into paninis or flatbread pizzas. I want to eat this saunce plus meaetballs every day - I kid you not. I really wish I had snapped a photo of this dinner, so good! Bring a large pot of water to a boil for the gnocchi. Mix the beef with the cheese, parsley, basil, garlic, egg, bread crumbs, salt, pepper, and a drizzle of EVOO. Form into 1.5" balls and roast in the oven for 18-20 minutes or until brown. Preheat a large, deep skillet over medium heat. Add the tablespoon of EVOO and the butter. When the butter melts, add in the eggplant and squash and sautee until soft. Add the flour and cook for 1 minute. Whisk in the wine and stock and bring to a bubble. Add the tomato sauce. Return the sauce to a bubble and reduce the heat to medium low. Cook until sauce thickens to a gravy consistency. Drop the gnocchi into the boiling water and salt the water to season it. Cook until the gnocchi are tender and floating, 5 to 6 minutes or according to the package directions. Drain well. When meatballs are done, add them to the sauce. Serve the meatballs and sauce over the gnocchi with a bit of grated cheese on top. Cake Decorating Course 1 ... Scary Clowns! Welcome back to menu planning!